The elderflowers are blooming. This is good on many levels. For one, flowers are just a prelude to berries. And berries are just a prelude to jelly. And elderflower jelly is something that my grandmother made as a child with her mother. I’m going to make some and bring it to Grandma Pellegrini. Now that the weather is warmer, Grandma P. can go outdoors. I paid her a visit and strolled her around in her wheelchair and we stopped to pick the honeysuckle and taste it. She smiled and told me about the elderflower jelly she used to make. I went to pick some. It is like a fine lace, soft and delicate, nutty and earthy smelling. Warm and sweet. 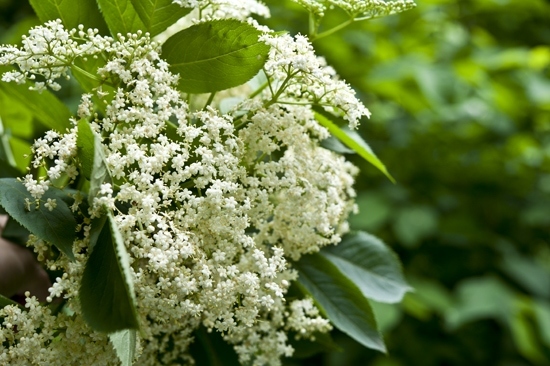 Elderflower is known to have medicinal qualities, a few drops under the tongue is said to boost the immune system. When you have flowers, there are two things that are lovely to make. 1. Elderflower syrup and 2. Elderflower fritters. The first of the two begins with a pot full of flowers. And in the now empty pot, add sugar. 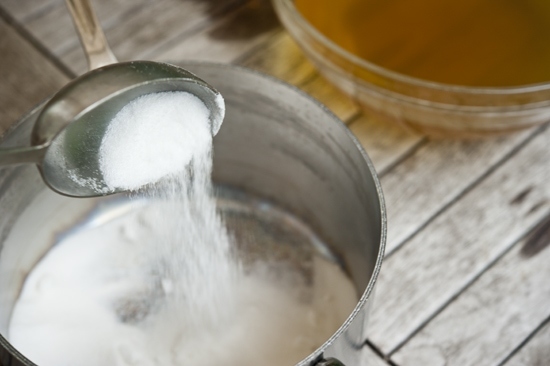 The reason you add sugar rather than stevia or agave is that the sugar preserves the syrup for a longer time and thickens it a bit. That being said, you could use a natural sweetener if you plan to use the syrup right away. Or you can not add anything at all and have elderflower water, which is lovely too. Next you’ll gather whatever jars you plan to store it in. A mason jar works well. 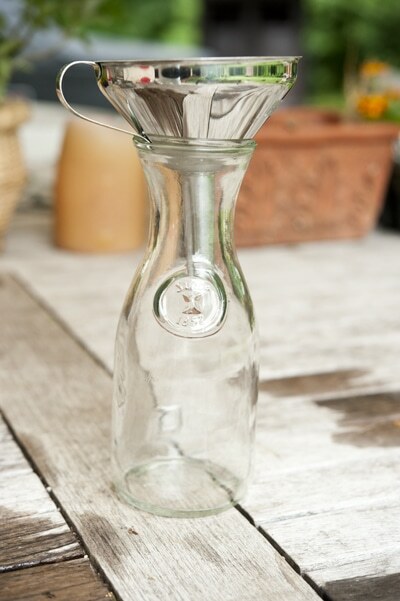 I happened to have this little carafe handy so I grabbed it. And then I got wicked smaht and used a ladle. Learn from my mistakes people, use a ladle! The syrup can be used for many things. It is subtle in flavor so I like to do something simple like make a spritzer out of it. It becomes darker over time, which makes a “blush pink” spritzer. This would also be good in champagne, morning oatmeal, yogurt or whatever else your love. All you need is about 1/4 cup of the syrup, or even less. A little goes a long way. It’s nice with a squeeze of lime too. Or orange, tangerine, kumquat, whatever your heart desires. Give this a try sometime! It’s so tasty. 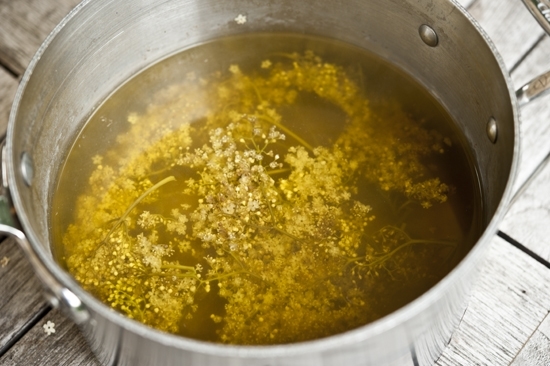 Place the elderflowers in a medium, heavy-bottomed sauce pot. Cover with the water and bring to a boil. Let simmer, covered, for 30 minutes. 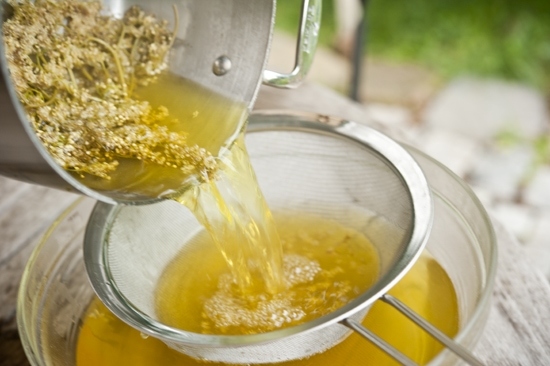 Remove the pot from the stove and strain the liquid into a fine mesh strainer into a bowl. Discard the flowers. In the same sauce pot add the sugar. Whisk the liquid back into the pot with the sugar. Bring to a simmer for 10 minutes more. Remove from the heat and, using a funnel and a ladle, pour it into mason jars to store in the refrigerator. 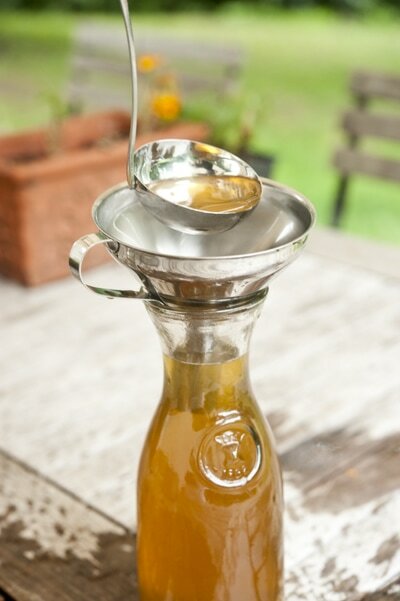 Use as a flavoring for spritzers or as a delicate flavoring for oatmeal, yogurt and other favorite things. I so need to find some elderflowers! Not sure where, but I’ll find them. We love St. Germain, and I can only imagine how much we would love this as well. Nothing like a St. Germain gin and tonic. Swoon. Elderflower fritters? My goodness, what’s that like, I’m so intrigued. Yummy! I’ve only tried St. Germain twice but may be able to hang with this a bit better. ; ) And how fun to make too. wow, I love the idea of using wild plants to make something sweet. this is such a great idea. and lucky you. a stroll with your grandma (how fortunate to still have her in your life) turned into something more than a wonderful memory! The thing I like most about these posts are the time you spend with your grandmother. It might not seem like much to most people but I bet it means everything to her. I love that you’re wicked smaht. LOL Love that line. And this post!! How brilliant! I wonder if you can use any other flowers??? (dont think those are available by me) Although I doubt that it would look as lovely as yours! Very interesting as I’m just about to make Elderflower Cordial & Champagen which both have lemon in it too. I was wondering about the shelf life of the straight elderflower syrup. Does it keep at room temperature? 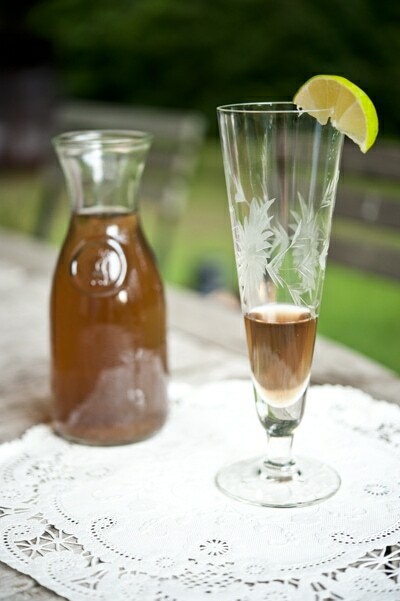 I’ll make a couple of versions of the cordial — one with sugar and one with lemon and sugar and test it. I’m imagining the acidity from the lemons will give it a better shelf life. I’m a little iffy about room temperature, but the champagne goes through a process of sitting at room temperature and then being refrigerated. Here’s Leda Meredith’s post about the elderflower champagne: http://ledameredith.net/wordpress/?p=929 There are some interesting comments about the bottling. I love the idea of giving these as gifts. I’m not crafty, but it would be cool to incorporate the flower into the packaging. Didn’t mean to, but i’ve left the syrup in the cupboard for 2 years and it was still great, little darker, but awsome on pancakes. Hi Sean, of course I know who you are : ) I didn’t know I could submit to Punk Domestics… I’ll check it out! The flowers are beautiful! Great way to use them! are you like a crazy culinary genius or what? This is so amazing! 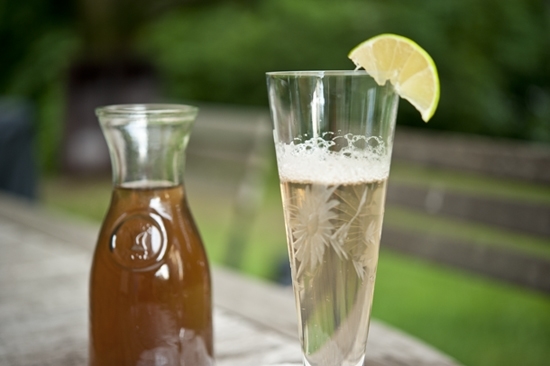 You can also make elderflower champagne which is DELICIOUS! 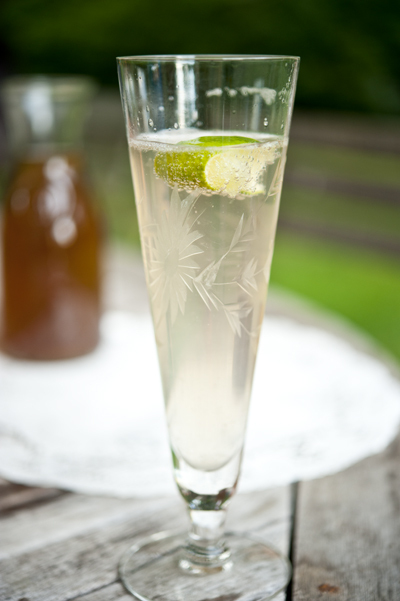 it naturally ferments and makes the alcohol and bubbles – cheers! What a brilliant idea! My favorite drink is my husband’s margarita. We usually have them on Sunday afternoon after church. He squeezes the limes while I cook lunch. It’s my favorite moment of the week. After all the heaviness going on in New Orleans right now I would more than welcome this Elderberry syrup. Sounds soothing & very tasty. The fritters sound good too. I’m so curious about this NOLA trip, I can’t wait to hear and see the details and the recap! I just “came over ” from PWC, and I love your site!! My grand mother did syrups with elderflovers and elderberries, I always loved it! Every fall I soak the elderberries in vodka or schnapps and use it as flu chaser. I love that idea! Elderberry is supposed to be very good for you. Yes, this would be lovely with lemon verbena, that’s one of my favorite herbs! Oh wow. Elderflower is my ALL TIME FAVORITE flavor. I cannot pass up and Elderflower Presse. My grandfather and I used to go and hunt for Elderflower berries and he used to make jam with them too. This is so lovely! 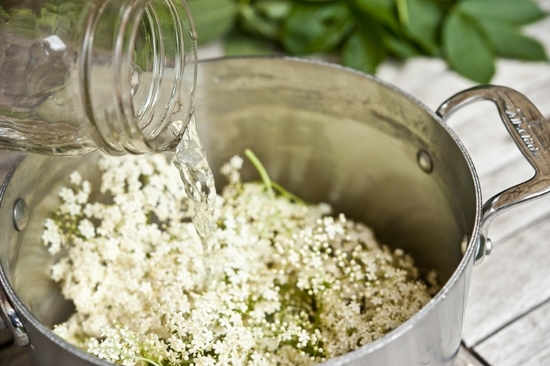 My English friend and I have made Elderflower Cordial once or twice when I was visiting her in Utah… I’m not sure where she got the Elderflowers from. I wish I could get some! So delicious. 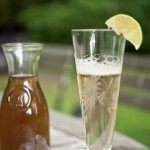 What a wonderful light summertime drink to make as a spritzer. Haven’t yet tried elderberry syrup, but sounds well worth the effort. I think I’ll need to put in an elderberry bush or two this year. Thank you for sharing these great ideas. 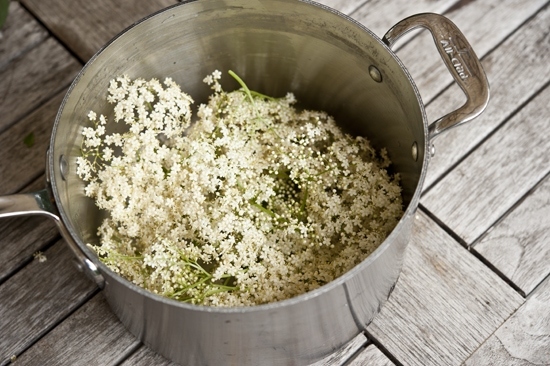 Put 7 elderflowers into large bowl with 1,2 kg sugar, 4 lemons cut in slices. Pour 3 L of boiling water over it. Add juice of one lemon and stir well. When the mixture cools down ad crumbled yeast (10g) and leave 5-6 hours. After 5-6 hours add another 9 L of water, stir and leave for another 5-6 hours. Strain the liquid, pour into glass bottles (not to the top) and close hermetically (best use metal cap screw on bottles). Keep in dark cool place. 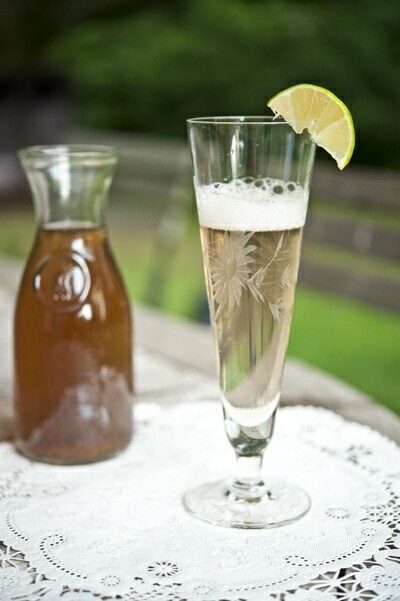 Drink is sparkling and very refreshing, it is originally Czech drink. The elderberry (holunder) bushes are in full bloom here (Germany) so the Wife and I just made up 5 liters. Add the sparkling water and a sprig of mint and pray for summer heat!